As a Linux user, it's still easy to contact your friends! See now the screenshots page for a visual overview of the other countless KMess features! We recommend you to use your distribution's package manager to download KMess 2.0.6! Download our newest stable release 2.0.6 now! There are binaries for various distributions as well as a source package for advanced users. Download KMess! 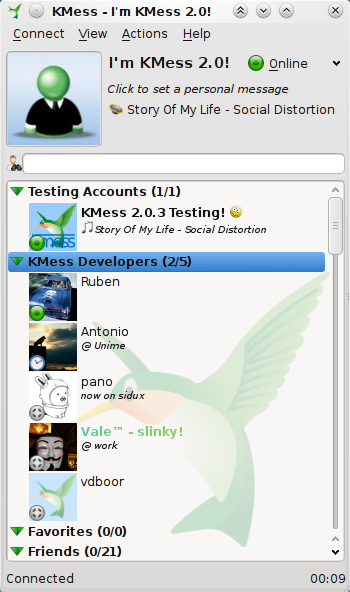 KMess is an alternative Live Messenger chat client for Linux. It allows Linux users to chat with friends who use Live Messenger in Windows or Mac OS. The strength of KMess is it's integration with the KDE desktop environment, it focus on Messenger-specific features and an easy-to-use interface. 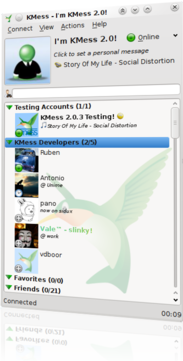 Like many Linux and KDE applications, KMess is free software. Our software's license is the GNU General Public License. KMess is Free and Open Source Software made by volunteers. You can contribute translations, report problems, make suggestions, improve the code, or add new features! Contact us if you'd like to help! Added tabs to the Contact Added User dialog. Added a fading effect when switching between the initial view and the contact list. Fixed login issues due to changes in the MSN protocol. Fixed possible crashes with the Contact Added User dialog. Fixed retrieval of display pictures from the online MSN storage. You can find the source code at the downloads page, and binary packages for various distributions will start flooding in soon. Thanks to 28 volunteer translators, KMess is available in 19 languages. Other people, without whom this release would not be what it is today, as well as the current members of the KMess team, are listed on our People page. Any remarks, notes, threats, treats, as well as bug reports can be posted at our forums. You can also send us messages using the LikeBack client built into KMess, accessible via Help -> Send a Comment to the Developers. We wish you a lot of fun and chatting with KMess! KMess now displays your previous conversation with a contact in the chat window. Significantly increased speed whilst loading chat history. Added a calendar feature to the chat history dialog. Added a button to the chat window to quickly access the chat history of contacts in the conversation. Added notifications for address book changes (contact added, removed, blocked, etc). Updated the Traditional Chinese translation. Fix a crash bug that occurred during offline message parsing. Added a small toggle button on the contact list to quickly enable/disable the "Now Listening" feature. Implemented the new KDE4 system tray specification. Added ability to drag-and-drop ink drawings from the conversation into the ink editor in order to be edited again. Fixed bug which caused KMess to fail to connect, instead giving an "Invalid Command Parameter" error. Fixed bug which caused the user's display picture to be reset upon login. Fixed bug where status was not changed from Idle upon wake up from sleep. Thanks to 26 volunteer translators, KMess is available in 19 languages. Other people, without whom this release would not be what it is today, as well as the current members of the KMess team, are listed on our People page.